I offer a variety of options for designing and building your Web site. I realized early on in my business that understanding how the most popular Website platforms function, and being able to work within them for SEO purposes, was crucial for success. Whether or not you need a simple, one-page parallax design, a site with a user-friendly management console, or a simple blogging platform, I will work with you to ensure your need are met. My development platform of choice has evolved to be WordPress, which I detail on my WordPress Development page. HTML is a mark-up language (versus a programming language) that uses tags to structure text into headings, paragraphs, lists, and links. It tells a Web browser how to display text and images. You can see a Web page’s HTML code if you select “view source” from the View menu in your Web browser. A feature of HTML that gives both Web site developers and users more control over how Web pages are displayed. With CSS, designers and users can create style sheets that define how different elements, such as headers and links, appear. These style sheets can then be applied to any page on a particular Web site. So in theory all the pages can be formatted the same way making it much easier. The term cascading derives from the fact that multiple style sheets can be applied to the same Web page. 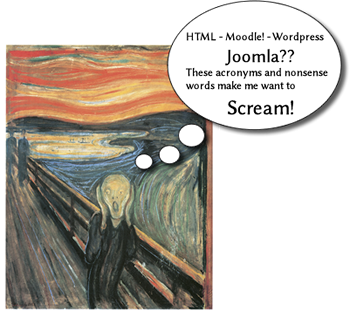 Joomla is a free and open-source content management framework for publishing web content. It is built on a model–view–controller web application framework that can also be used independently. a powerful open source shopping cart system that is designed feature rich and user friendly. It is a robust E-commerce solution for Internet merchants with the ability to create their own online business and participate in e-commerce at a minimal cost. Contact me for more information about Web Development!